Upon specification of your search criteria (pick-up/return location, date and time) in the above form, you will be provided with all our relevant and actual vehicle offers. If you wish to return a car in a different location than Linz, please tick the 'Different Drop Off Location' check box. The most recent car booking in Linz has been made on our website 719 minutes ago. In Linz, we offer for rental 5+ car categories from 5+ rental suppliers. Best offers. We collect the most interesting rental offers from all suppliers operating in Austria. Use the search form above to examine specific cars available for your travel period. An early reservation allows you to obtain the cheapest offers in Linz. Car selection. On the search results page, you can sort the cars available in Linz by their rental price and rating. You can also filter the search results, specifying desired car type, transmission type and fuel type. Car choice. In Linz, the diversity of car types and price tags increases, if you specify that you will pick-up and drop-off your car in a daytime. Please note, that vehicles with an automatic transmission are quite rare in Austria, therefore, their confirmation may take from one day to one week. Rental terms. Each vehicle presented in the search results for Linz has its own individual rental terms. These terms are available via the link 'Important Information' located below the price indication. Rental documents. Before traveling to Linz, print the confirmation voucher. Rental desks in Austria are not accepting electronic vouchers. Also, do not forget to bring your ID and a valid credit card. OrangeSmile.com wishes you a fantastic time and safe driving experience around Linz! Linz is a city that occupies the third position in the list of largest settlements of Austria. Here you will always see numerous buses with tourists and bright and picturesque places full of diversity. Linz carefully keeps its history. You can see all main sights of this place in its historical part, so called “Old City”. While walking on silent, shadowy and narrow streets of this part of Linz you will definitely find numerous cozy taverns and beer houses, small churches primarily designed in the Baroque style and two abbeys - Wilhering and St. Florian. Linz is located on the north of Austria on the bank of the Danube River. The city was built as the military fort near the border with Germany. Linz was founded in approximately 410 BC. The central part of the city organically combines Baroque stylistics of that time with modern complexes built in the modern style. The historical center of the city is kept in very good condition till our days. Tourists may also enjoy visiting the old way that connects the piedmont region of Alps with the north of the country. The main square of the city is located right on the bank of the Danube River. On this square are located the central town hall, a monastery and castle Ursulinerhof, and Landhaus – the building in which are located the government and parliament of the city. 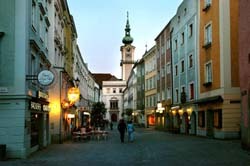 Linz can be also called a cultural city as here are located numerous theatres and music halls. Among them are Unzer theatre – a free assemble, which performances combine choreographic, comedian, dramatic traits of the authentic play; Phoenix Theater that specializes on classic performances; Federal Theater that works for over 200 years and features wide choice of plays; Chameleon Theater, Concert Hall of Bruckner and Posthof.